The easy way to Put and Enjoy Movie, Music on Samsung Galaxy S II. Step 1: Download Aunsoft Samsung Galaxy S II Video Converter, install and run it. Step 2: Please drag and drop or click “Add” to import kinds of movies/musics you want to put on Samsung Galaxy S II to this program. Tip: Click “Settings” to set the Video/Audio Parameters like Size (resolution), bitrate, frame rate, etc to be more suitable for Samsung Galaxy S II. For example: Set Size/Resolution to 800*480 pixels. Step 4: Start the conversion from movie to Samsung Galaxy S II. 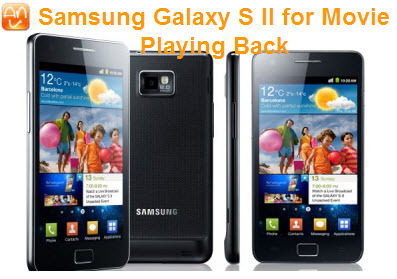 After conversion, you can put the music; put the movies on your Samsung Galaxy S II for enjoying now. Tip: If you want to put and play DVD, Blu-Ray movies on your Samsung Galaxy S II, you could select Aunsoft Blu-Ray Ripper. For Mac users, please choose similar products for Mac. Now, thanks for your reading, and hope you could enjoy the program and well put and play movie/music on Samsung Galaxy S II.